Discussion in '9/11' started by CurlyBurl, Sep 11, 2013. Are these numbers and claims accurate? They came from one of the many 'Truth' Facebook pages, which I often find to be incredibly inaccurate or making claims which I can't find reliable sources on. Furthermore, if the "six months" claim is accurate, that's odd - but is it really that odd considering there had already been a bombing there before? It's more complicated than that - the WTC complex was insured via multiple insurance policies with 23 different companies for a total of $3.55 billion for a single event. He asked that it be considered two events, so the limit be raised to $7.1 billion. The insurance companies disputed this, and there was a court case, and the resultant total limit was much less the $7.1 billion ($4.577 billion). And this only covered half the cost of rebuilding the complex, in 2007 this was estimated as $9 billion. Public investment (loans) was required to cover the difference. The money from Royal & SunAlliance USA, the American subsidiary of a big British insurer, Royal Sun Alliance, represents less than 3 percent of the total cost of the massive project, now estimated at $9 billion. But with a fragile budget and rapidly escalating construction costs, every dollar counts. Mr. Silverstein’s aides say he may miss construction deadlines if the insurer fails to pay up, or he could be forced to scale back the project, which includes the 1,776-foot-tall Freedom Tower and three other skyscrapers. It has always been a struggle to get enough money to rebuild ground zero. The insurance proceeds, about $4.6 billion, only covered about half the total cost. The other half had to be made up with a combination of state, federal and private financing. The insurance policies for World Trade Center buildings 1 WTC, 2 WTC, 4 WTC and 5 WTC had a collective face amount of $3.55 billion. Following the September 11, 2001, attacks, Silverstein sought to collect double the face amount (~$7.1 billion) on the basis that the two separate airplane strikes into two separate buildings constituted two occurrences within the meaning of the policies. The insurance companies took the opposite view, and the matter went to court. Based on differences in the definition of "occurrence" (the insurance policy term governing the amount of insurance) and uncertainties over which definition of "occurrence" applied, the court split the insurers into two groups for jury trials on the question of which definition of "occurrence" applied and whether the insurance contracts were subject to the "one occurrence" interpretation or the "two occurrence" interpretation. The first trial resulted in a verdict on April 29, 2004, that 10 of the insurers in this group were subject to the "one occurrence" interpretation, so their liability was limited to the face value of those policies, and 3 insurers were added to the second trial group. The jury was unable to reach a verdict on one insurer, Swiss Reinsurance, at that time, but did so several days later on May 3, 2004, finding that this company was also subject to the "one occurrence" interpretation. Silverstein appealed the Swiss Re decision, but lost that appeal on October 19, 2006. The second trial resulted in a verdict on December 6, 2004, that 9 insurers were subject to the "two occurrences" interpretation and, therefore, liable for a maximum of double the face value of those particular policies ($2.2 billion). The total potential payout, therefore, was capped at $4.577 billion for buildings 1, 2, 4, and 5. An appraisal followed to determine the value of the insured loss. In July 2006, Silverstein and the Port Authority of New York and New Jersey filed a lawsuit against some of its insurers, for refusing to waive requirements of the insurance contracts that Silverstein claimed were necessary to allow renegotiation of the original July 2001 World Trade Center leases. This litigation, was settled together with the federal lawsuits and appraisal, mentioned in the prior paragraph, in a series of settlements announced on May 23, 2007. Silverstein's lease with the Port Authority, for the World Trade Center complex, requires him to continue paying $102 million annually in base rent. He is applying insurance payments toward the redevelopment of the World Trade Center site. And none of this applies to WTC7, which was owned, not leased, and under a separate insurance policy that was paid without much fuss. Wasn't the final number on insurance merely a compromise between Silverstein and his partners? If I remember correctly, Silverstein wanted less and his partners wanted more. Considering the costs of rebuilding the complex are more than the insurance he collected, wouldn't this be the dumbest insurance "scam" in the history of mankind? Also, we're dealing with insurance companies - not exactly the easiest place to get money from. The idea that it was just "fortuitus" for the WTC towers to have been covered for a terrorist attack is a little misleading. There had already been an attack using conventional bombing tactics, so it was known to be a possible target. Insuring for the eventuality was simply a smart thing to do. The above meme also insinuates that insurance covering terrorist acts was odd (or at least uncommon), at that time. Do we know that to be the case? Or were all skyscrapers and/or known potential targets insured for this kind of thing? Larry Silverstein collected 865 million dollars for wtc #7. He claimed the collapse was due to the twin towers damaging wtc#7 when they fell. I'd like to know who made that definitive determination? What investigation was there that allowed for that conclusion? There were witnesses that gave testimony that would have proven that wtc#7 had other circumstances that resulted in the collapse. Also Mr West,.......you state that Larry Silverstein only collected 4.577 billion dollars, which is far short of the estimated 9 billion dollars necessary to rebuild. You state that public investment loans will be needed for the remaining funds needed to rebuild. You insinuate, as do others on this blog, that Mr Silverstein didn't make any money because the cost to rebuild is far greater than the amount he collected in the insurance settlement. I think I've represented your assertion correctly,..haven't I? The problem with your contention, and I can't believe you don't realize this sir, is that Larry Silverstein only invested about 115 million dollars of his own money when he made the purchase. You're trying to make it appear as though Larry is actually losing money based on the cost to rebuild but that's a little trick isn't it? Larry didn't have full ownership in the twin towers to begin with; he put up 115 million dollars and the rest was a loan. Therefore, when he collected 4.577 billion dollars, it was almost all pure profit. If he was to invest the entire 4.577 billion into the new rebuild, then he would have 4.577 billion dollars equity in the property. If he chose to, he could pocket that cash right up front, then seek financing for the rebuild just as he obtained financing for the twin towers. Either way, Larry has over 5 and 1/2 billion dollars ( including the payoff for wtc#7 )with his name on it. If Larry decided to sell the twin towers( when they were still standing), he would have realized the 115 million dollars that he originally invested and would have come out about even. 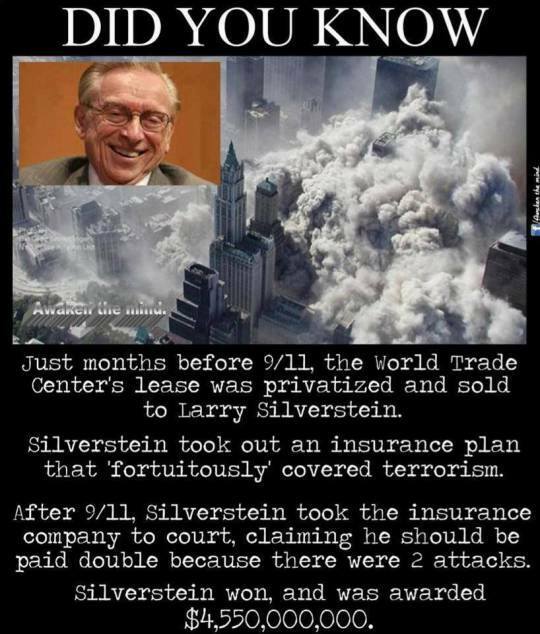 With this insurance settlement he now has about 5 and 1/2 billion dollars in his pocket( including the more than 800 million dollars from the wtc #7 insurance payoff).....The truth is that Larry Silverstein made billions from the death of innocent people. His insistence that the agreement was for a double indemnity policy and his insistence that the policy specifically indicated terrorism is not a suspicious circumstance,......it's far more than just suspicious. Mr West, are you honestly going to claim that you didn't realize, using your intelligence, that what I've explained here is the obvious truth? The insurance payoff, and the resulting 5 plus billion dollar profit for Larry Silverstein was beyond your comprehension? Really,........... Mr West? Can you provide a source for this, please? Mr West, are you honestly going to claim that you didn't realize, using your intelligence, that what I've explained here is the obvious truth? No I'm not going to claim that. Perhaps you could quote some references for you claims? Nice to see you again, Marcus. and I still cheerfully (and patiently!!) await it. many think Silverstein naively insured the WTC for significantly less than he should have, given rebuilding costs. from 9/11...well...I won't claim to be able to follow your arguments. and it would be really nice to see a credible source or two that backs what you say. Could you please enclose a link or two to a trustworthy source that agrees with your interpretation? Surely they exist, if it's true. Thanks! ...His insistence that the agreement was for a double indemnity policy and his insistence that the policy specifically indicated terrorism is not a suspicious circumstance...it's far more than just suspicious. He ended up buying a larger insurance policy than he initially planned, but a smaller policy than his lenders suggested. I don't think you're using the term double indemnity right? As far as I know that would refer to an increase in payout by an agreed upon multiple for a claim caused by an accident. Like if someone with a life insurance policy had a piano dropped on them. I don't know about Silverstein trying to claim anything like this... also I'm not familiar with any other definition of double indemnity. ...Larry didn't have full ownership in the twin towers to begin with; he put up 115 million dollars and the rest was a loan. Therefore, when he collected 4.577 billion dollars, it was almost all pure profit... If he chose to, he could pocket that cash right up front, then seek financing for the rebuild just as he obtained financing for the twin towers. Pure profit? So who are these lenders that just let Silverstein pocket a bunch of money without them getting their investment back? I am a bit confused by this "OBVIOUS TRUTH". If Larry Silverstein only put up 115 million dollars out of a total of 3.2 Billion, then his stake in the Centre was only 1/27th of the whole. The rest of the ownership is business partners and/or loan companies who want their money back with interest. SO, if the total payout is 4.55 billion, how come someone who only owns 1/27th of the centre gets to pocket ALL of it, and not 168 million? Don;t you think his business partners and loan companies are going to have something to say? That is "obvious truth " to me. As the terms of his lease ALSO require him to rebuild, he didn't have much choice. also, if you get a loan, you have to pay interest back, so the only way it would make sense to get a loan of 4.55 billion and not using the 4.55 billion your company has, is to use your billions to start a pay day loan company. It;s the only possible way you would earn back MORE money than the interest you were paying on your loan. As has already been mentioned, the WTC had ALREADY had a terrorist attack so insuring against terrorist attacks is prudent, NOT suspicious. I'd like to echo these particular statements. Silverstein never bought or owned the Twin Towers - he leased them from the Port Authority for 99 years at something like $100 million per year. I think I remember he still had to pay that lease for a while even after the buildings were destroyed, despite not earning rent from tenants. The new 1WTC was developed and is owned by the Port Authority, not Silverstein. So while Silverstein had to pay for the lease, the insurance, then for rebuilding, despite never being the owner and not having paying tenants for years. Doesn't sound like a winning scheme. Silverstein got to develop the other towers, 2-4, after a series of negotiations, swaps and court decisions. Number 2 is on hold, Number 3 under construction (with a bind that all public investment must be repaid before Silversteimn can start making profit), Number 4 is the only one that's completed (in 2013) - and it's owned by the Port Authority. I don't know the details of who paid what money when to whom in exchange for what properties, rights and all, and so I have not the slightest idea how much money Silverstein may have made or lost to date on the WTC after 9/11, compared to what he would have earned had the old buildings not been destroyed. My hunch is that he lost billions. What I do know is that claims by truthers of the sort "Silverstein made out like a bandid" are totally and utterly unsupported by any decend accounting as suppurting evidence. I remember there being a really great piece in the NYT about Wachtell's victory on the "two incidents" issue too, but I can't seem to find it at the moment. I should also add that my take away from the above is that the ultimate disposition of the site was subject to intense negotiations involving dozens of principles, multiple government agencies with competing jurisdictions and interests, many politicians, and hundreds of the best lawyers in the country (many of whom were directly affected by the 9-11 attacks by virtue having lost friends, colleagues, and/or family). The notion that all or even a substantial portion of these highly sophisticated and people with disparate and often conflicting motivations were somehow acting in concert or even in a way that someone like Silverstein could have predicted ex ante is simply ludicrous. But that's what you have to believe in order or to believe the pay-outs Silverstein received were the result of some sort of premeditated plot whereby he played a role in facilitating the attacks in return therefor. And let's not forget that the insurance companies who suffered major losses as a result of attacks, including several major foreign insurance companies, had pretty obvious reasons (hundreds of billions of reasons, actually) to expose any fraud by Silverstein and his associates. Wikipedia-7 World Trade Center. About half way down the page under 'construction'. Second paragraph. The information there indicates that Larry Silverstein received an insurance payout of 865 million dollars for wtc#7. It also states that Larry had a 400 million dollar mortgage outstanding. The math is that larry profited by 465 million dollars from the insurance settlement for wtc#7. Larry knows how to take care of Larry. Any assertion that he lost money as a result of the events on 9/11/2001 are absurd . Larry Silverstein made his way to where he is today by being shrewd. He doesn't care to involve himself in situations that lay him bare to circumstances that could diminish his wealth. Larry's been around for awhile and he's developed a habit of doing what's necessary to keep his capital safe and out of harms way while relieving others of billions of dollars on the basis of semantics and good old fashioned luck that seems to be Larry's constant companion. The details can be presented to show how much Larry profited overall from the entirety of the insurance payout, but that will take some time since I don't have a group effort behind me. I'll be able to satisfy the various distortions that the team prepared for my benefit. Not sure why you re-posted all that. I'm just asking for reputable sources that would agree with your very convoluted math. I need a solid, reputable source for this. Wikipedia isn't a source. Surely, however, it does have a proper citation to an external source. Please quote and provide the exact source to be examined. Thank you. It is also off-topic, but a few months back you claimed that there is a video of a woman "dumping blood" on the sidewalk during the Boston Marathon. Perhaps you can start a topic with that video over in the Boston Marathon section. Silverstein still has a $400 million mortgage on his old building. Most of that was converted to bonds and sold to investors, who now want Silverstein to pay them off with insurance proceeds before using the money to fund new construction. "The bondholders, when they initially bought these bonds, were not anticipating construction loan risk," said Karen Trebach, a Fitch Ratings analyst. Silverstein will soon collect up to $861 million in insurance on 7 WTC and has said he intends to pay off the mortgage first, Trebach said. But that would leave Silverstein with less than the $640 million he needs to rebuild 7 WTC. Which contradicts his theory. Silverstein did not make any money. He lost money. Can you explain how he lost money? The external source that you reference doesn't indicate Larry lost money. Can you provide the math? It's right there. He got less money from the insurance than it cost to rebuild the WTC. If your $500,000 house burns down and costs $300,000 to rebuild, but the insurance only gives you $200,000, then you have lost money. he has a 400 million mortgage he needs to pay off first. BUT as per his agreement he HAS to rebuild. The cost of that is 640 million. SO he is overall making a 170 million LOSS on the deal. I really don't see why you find the maths that hard to work out. Before 9/11 Larry had a building and a $400m liability in the mortgage. After 9/11, accounting for insurance payout, mortgage settlement and construction costs, Larry had a building having invested $170m, but his liabilities were nil. So, he essentially cleared a $400m debt at a cost of $170m, which leaves him $230m up compared to his before 9/11 situation. But he has lost 5 years income. The old 7WTC had 1,868,000 sq ft of office space which, at say $30 per sq ft per month for 5 years, is $672m. With that he could have paid off the $400m mortgage with $272m to spare. In 2006 he was $442m worse off regarding 7WTC than he would have been had 9/11 not happened. Worse still, despite being taller than the old one, the new 7WTC sits on a smaller footprint and has only 1,700,000 sq ft of office space and thus a lower capacity to generate rents. So his potential annual income from 7WTC has dropped 9% (about $60m) per annum. *assuming that all other the other costs of doing business are the same in both scenarios, the effects of interest and inflation are negligible and that 9/11 had no effect on rents in downtown manhattan, which I accept are lazy assumptions taken for convenience. Does LS own the museum and any other $$ generating entities on the site? Just Curious... I am sure that the Museum admission doesn't generate enough to cover his losses, but could be factored in. Either way, it doesn't amount to nearly what anyone would call a profit.... Much less enough of a profit to justify taking part in mass murder to gain said "profit". Also...Looking at the initial post... Does it make sense to change your insurance plan to cover something that you plan on doing in the immediate future? Seems kind of fishy... and stupid, if you are the perpetrator of that insurance scam. I would think that someone as smart as Silverstien would realize that it wouldn't look good. I am not going to call my insurance and tell them to cover me if I "accidentally" crash into a Denny's and then crash into a Denny's the next day. I am smarter than that, I am sure that Silverstein was too. Mere coincidence. Remember this if I actually DO crash into a Denny's tomorrow. it doesn't amount to nearly what anyone would call a profit.... Much less enough of a profit to justify taking part in mass murder to gain said "profit". ....and none of these calculations factor in the opportunity costs of having no revenue generating buildings for over a decade. Does LS own the museum and any other $$ generating entities on the site? I have no idea, but the (very rough) estimate of a $1,272m loss relates only to 7WTC not the whole of Larry's interest in the WTC site. With any big money situation it gets complicated. Bottom line though, there was no apparent profit from the insurance. If people are making claims about the nature of the insurance, and comparing it to older insurance, please include evidence of those claims, and not your own paraphrasing of what you think was in the insurance. Otherwise your post may be deleted. 1) Larry would borrow to pay for the leases on the buildings. Why would someone put themselves in such massive debt, only to see all revenue disappear for 10+ years? Sure, he got a $7 Billion payout. Bit it is doubtful the Port authority would left him off the hook for replacing the buildings. So he has to rebuild every building on which he owned the lease. Replacing B1B2 alone (something equal to its current value) would eat up most of the $7B. Replacing the other buildings is a straight loss. You have not taken into account the differences between equity, debt, and market value. Let E represent equity, D represent debt, and MV represent market value. Equity is the value of the owner's investment in the building (as opposed to the bank's investment in the building). Equity is equal to market value minus debt. The point of equity is, if the owner were to sell the building on a given day then, excluding real estate commissions and the seller's closing costs how much money would the owner get from the sale? On the day of purchase of a building the buyer's equity equals his down payment - assuming he bought at market value. That is, if he paid for the building what it is really worth in that real estate market then he neither made nor lost money by buying it. The same applies to constructing a building because there are always loans, such as construction loans. For the purpose of determining E, MV and D we can treat a construction loan the same as a mortgage loan. It is all D.
The debt is the total amount of money that the owner owes to banks on that building. In other words the sum of all the loans against the building. (It doesn't matter how much he owes on other buildings or any other sort of loans. For each building on any given day there is a distinct value for E, D, and MV although D is the only value that can be known down to the penny, because market values fluctuate and are not always known). Another way to think about D is that it is the value of the bank's investment in the building. D goes down gradually as the owner makes a mortgage payment each month consisting of principal and interest. The principal part pays down D. D can actually go up such as when the owner does not make his mortgage payment and the bank charges late fees, other penalties and interest. If you buy a building and pay all cash then your debt = 0. If you build a building and pay all cash then your debt = 0. In all other circumstances your debt is nonzero because you have borrowed money and therefore you have debt. You have to repay that money and you have pledged the building as collateral for that loan, meaning that the loan agreement says that if you do not make your payments on time then the lender can sue you (foreclose) and take ownership of the building back from you in lieu of your payments. If you put down (make a down payment of) 20% of the building's value and you borrow the rest, the other 80%, from a lender (say, a bank) or lenders, then your debt = the amount of money that you borrowed. It's the 80%. The market value of a building is a function of the real estate market. Market values go up or down depending on all kinds of factors including the health of the economy, the demand for such a building in a given location, interest rates, etc. None of these factors affect the debt, D.
Let's take the example of a $1 billion building. If there is a catastrophic event such as a controlled demolition organized and executed by individuals and agencies of the government to blow up a building then which of the 3 variables changes? D, E, or MV? The debt does not change. If you (or Larry S.) owed let's say $800 million before the building demolition then you still owe that much the day after the demolition. You may have insurance policies but that is another story. Until you collect on your insurance policies you still owe $800 million. If you reduce your debt you will do so by paying it down with cash out of your own pocket or (not likely in this case) refinancing. The market value obviously changed. The market value of the Twin Towers as of September 12, 2001 was only the value of the land. The buildings were demolished but the land was not. From a rental point of view (in other words income) the market value was practically zero: it was zero until such time as a new building could be built. You could say that the value was actually the value of the land minus the cost of the cleanup. Obviously the Twin Towers had to be cleaned up before anything new could be built on that site. The equity obviously changed. Remember the formula: E = MV - D. Any time the market value is less than or equal to the debt the equity is zero. There isn't any such thing as negative equity (well, rarely). One can say that the building is "under water" or "upside down". Make sense? In the case of WTC 7 there were loans against the building as previous writers have said. As Marcus 112 wrote (#17) Lucky Larry owed $400 million on WTC 7 and collected $865 million from the insurance policy. In this case it doesn't really matter what the market value (MV) was; the insurance policy paid a certain amount that may have been greater than or less than the market value BUT obviously Silverstein could not turn around and sell the building after 9/11 because it was demolished. Therefore $865 becomes in effect the market value. His equity is per the formula above, E = MV - D. In this case it's $865 million minus $400 million = $465 million. That is as of the day the insurance company pays him. He had $465 million in equity. He could have done anything with that money; donated it all to the Red Cross, bribed elected officials, invested it with Warren Buffet or in the stock market, or spent it all on jewelry and vacations (a LOT of jewelry and vacations). It was his money to spend as he chose. Now we turn to the "new" WTC 7. Silverstein could have sold the land, built a parking lot, built a mall, or built another tower. As the owner of WTC 7 he did not have to do anything in particular with the building. But let's say for the sake of argument that he was obligated to build another building on that site. And let's also say that the cost of building that building would be $640 million. Knowing that, what are the values for MV, D, and E? The only value that is known from the above information is MV, which is $640 million. We do not know D or E from the above information. Other sources may have it. But we do know that D + E = MV. Did Silverstein pay all cash for the new WTC 7? I doubt it, but let's say that he did. In that case his D for that building would be zero (as in the example given earlier) and his E would be $640 million. And MV hasn't changed: it is still $640 million. Let's take another example at the opposite end of the spectrum: Suppose Lucky Larry put down $0 (zero dollars) for the new WTC 7 and borrowed the entire amount needed to build it. In that case his D would be $640 million and his E would be zero. Most likely Lucky Larry borrowed some amount of the $640, likely much more than half. Let's suppose that he made a down payment of 20% or $128 million and borrowed the balance, the other 80% or $512 million. In that case as of the day the building is finished his D = $512 million and E = $128 million. Remember where that equity came from: his own pocket. Not from the banks. The banks loaned him the $512 million. You can substitute any other numbers in for his D and E as long as they add up to the MV, which is $640 million. If, as we are assuming, he was obligated to build a new WTC 7 what does that tell us about his finances? Only the value of MV. It tells us nothing about E or D.
But the only meaningful comparison to find out whether Lucky Larry made or lost money on WTC 7 is the E before 9/11 compared to the E immediately after 9/11. How much did his equity change as a result of 9/11? That is the real question. We do not know (it's not in this discussion as far as I know) how much Lucky Larry paid for WTC 7. Is it? Let's say it was $50 million. What he does with that $465 million left over after paying off his mortgage does not affect his equity in the short run. Obviously the new WTC 7 could go up or down in value. But it is a wash. If he put any amount of money, (call it LL for Lucky Larry) into the new WTC 7 then that would be his equity as of the day it is finished being built. It makes no difference. He could make a smaller down payment (say, 10%) and have less equity in the new WTC 7 or make a larger down payment (say 45%) and have more equity in the new WTC 7. Or as in the earlier example a 20% down payment and an 80% loan. It makes no difference. His down payment equals his equity as of the day the new building is finished. Building the new building does not change his wealth, his equity. It is only a transfer of form: his equity goes from being cash in his bank account to being his equity in the new building, but the amount does not change. That explains how he made money on 9/11. To find out the actual amount all one has to know is the market value, MV, as of September 10, 2001. See also my response to Efftup #24. The first half of your post is correct. The second half is not. Lucky Larry had signed a 99 year lease on the Twin Towers but he owned WTC 7. As the owner he could have done anything he wanted with that piece of land after 9/11. He was under no obligation to rebuild, or rebuild anything in particular. Also, once he pocketed the $465 left over from WTC 7 after paying off his mortgage he could have done anything he wanted with that money. That was his money with no strings attached. See my response to Mick (#17). If somebody tells you, "Efftup, you have to build a house that costs $300,000" does that mean you have to? No it does not. You can tell them to take a hike. On the other hand if you have already signed a contract say, for example, promising to build a house for somebody and give it to them, then does that cost you money or earn you money? It depends on what else was in the contract. Home builders do this all the time: they sign a contract with a person to build a $300,000 home for that person. Do they do this for free? Not any contractor that I have ever heard of. They do it for a fee. You can safely assume, and it is true in every single case, that the contractor only signs a contract that will make money for him. In other words the contractor's total cost has to be less than $300,000 (which he is going to be paid by the buyer). Obviously the contractor would not sign a contract where he assumes he is going to lose money (well, unless he is repaying a favor or something but that has nothing to do with the math). If Lucky Larry had committed to rebuilding WTC 7 (which as the owner he had not) then he would still have control over how much money he would put into the new WTC 7. Suppose the new WTC 7 would cost $640 million to build. He could make a down payment (his total out of pocket investment) of let's say 20% and borrow the other 80%. 20% is $128 million and 80% is $512 million. The end result as of the day the new WTC is completed would be that he had equity of E = MV - D or $640 million minus $512 million = $128 million. The process of building the building did not change his equity, his wealth. It only changed the form of his equity, which went from being cash in his bank account to equity in the new WTC 7. Building a new office building is a wash, a net zero, in terms of his wealth. Of course it may appreciate in value and earn income, which he hopes, and that is why he builds it. When you say that he was "obligated" to rebuild and the new building would cost $640 million you are assuming that he doesn't get any equity in the new building. But he does. Of course he does. If he invests $640 million of his own money (which he doesn't have to) then he has, as of the day the building is finished, $640 million in equity. He has not gotten richer or poorer. However he got a LOT richer on September 11, 2001 when his equity went up sharply from an unknown figure (MV as of September 10, 2001) to the amount of equity he had after collecting his insurance policy and paying off his mortgage, which was $465 million. How much richer did he get on WTC 7 on 9/11? The value is the difference between $465 million and the MV as of September 10, 2001. See also my response to Mick on #17. The problem is that the loss of the building and the insurance settlement only form part of the financial consequences of 9/11. You haven't put together an estimate of what 5 years lost rent might be nor the ongoing impact of having a smaller space to rent out once WTC7 had been rebuilt (see post 25). If you take everything into account, it is clear Larry would have been considerably better off in 2016 had 9/11 not happened. Your message is about 2 issues: his equity (E) and his income. As I wrote in #33 the only meaningful comparison to find out whether Lucky Larry made or lost money on WTC 7 is the E before 9/11 compared to the E immediately after 9/11. We do not know the value of his equity as of September 10, 2001 but we know that after 9/11 it was $465 million. That is cash in his pocket after paying off his $400 million mortgage. When you say that "Larry had a building" that does not tell us anything about how much equity he had in the building, which is the key figure. He could have anywhere between zero and MV, the market value, in equity depending on how much money he had borrowed. Remember that tens of thousands of Americans "had a building" (which was their house that they lived in) after the 2008 real estate market crash but they got foreclosed and had more debt D than equity E. They were "under water" or "upside down" with their equity. The point is that to "have a building" can be good or bad depending on one's equity in that building. With the new tower that replaced the Twin Towers I don't know where you got your figure that he invested $170 million but let's take that number as correct for the sake of argument. If he invested $170 million in the new Tower then that was his equity in the Tower as of the day it was complete. Same with any other figure. If for example he had invested $500 million in the Tower then he would have $500 million in equity as of the day it was complete. The market value MV of the Tower could go up or down from there as real estate values do; they fluctuate. Whatever amount he invested in the new Tower was his equity E in the Tower as of the day it was complete. Where you wrote, "So, he essentially cleared a $400m debt at a cost of $170m, which leaves him $230m up compared to his before 9/11 situation" no that is not true. He "cleared a debt of $400 million" and earned a profit of $465 million minus MV of WTC 7 as of September 10, 2001 by doing nothing (in terms of building construction) just by watching the 9/11 attacks happen. It didn't cost him anything to clear that debt and make that profit. It was a direct result of his insurance policies, the market value MV, and the 9/11 attacks. His investment in the new Tower is a separate calculation independent of his profit on WTC 7. The second part of your message is about lost income from rent. Your estimate for monthly rent per square foot, $30, is way too high. You did not provide any factual basis for that number. This article says that in the new Tower the rent is $69 per square foot and that means PER YEAR. In other words it is just below $6 per square foot per month. ($6 times 12 months would be $72). This article says office space in New York City costs $6.16 per month or $74 per year. = $134,496,000 in lost rent over 5 years. You also must take into account his mortgage payment. I do not know what interest rate he was paying on his $400 million mortgage but obviously after he paid that off with the money from his insurance policies he did not have to pay his monthly mortgage payment any more. Assuming he had a 30 year fixed rate loan of $400 million at 4.0% interest his monthly mortgage payment would have been just over $1.9 million. That is $22.8 million per year. In 5 years that is $114 million. Therefore he only lost $134 million in rent in those 5 years but he saved (because he did not have to pay it) $114 in mortgage payments. Therefore his net loss of income, offset by not having to pay his monthly mortgage payment, is only $20 million. $465 million minus MV as of September 10, 2001 minus $20 million. It's still an enormous huge profit. the only meaningful comparison to wether Silverstein made or lost money is if he made or lost money. Your mental gymnastics doesnt change the fact that he lost money. It's not gymnastics. I showed you the calculations of how much money Lucky Larry made on WTC 7 on 9/11 and the factual basis for them and assumptions. Where are your calculations? What is your factual basis? What are your assumptions? that was already covered in this thread. no need to repeat the numbers. Check out the 2nd post in this thread from Mick. You might also want to review the posting guidelines.